The Marshmallow has been rolled out globally and will be currently available in Russia, Algeria, India, MENA Arabic, US, Malaysia, Saudi Arabia and Thailand. Other regions will follow soon. The models which will receive the update are the single-SIM E6653 as well as the dual-SIM variants E6633 and E6683. The update in the form of Firmware 6.0.32.1.A.1.163 is available through the Sony PC companion, and an OTA update is expected soon. Today is a big software day for Sony Mobile, as well as starting theAndroid 6.0 Marshmallow update for the Xperia Z5 series, the company has also started the update for both the Xperia Z3+ and Xperia Z4 Tablet. 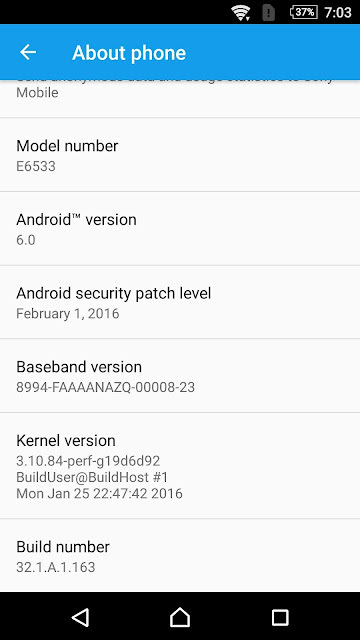 Firmware build 32.1.A.1.163 represents Android 6.0 Marshmallow, the same as the version number on the Xperia Z5 series. At the time of writing, the update is live on both Wi-Fi (SGP712) and LTE (SGP771) variants of the Xperia Z4 Tablet and the single-SIM Xperia Z3+ (E6553), however we expect the Xperia Z3+ Dual to follow shortly. As always, we will include FTF firmware links below in due course. Please do post screenshots and let us know your impressions below as soon as you have updated.